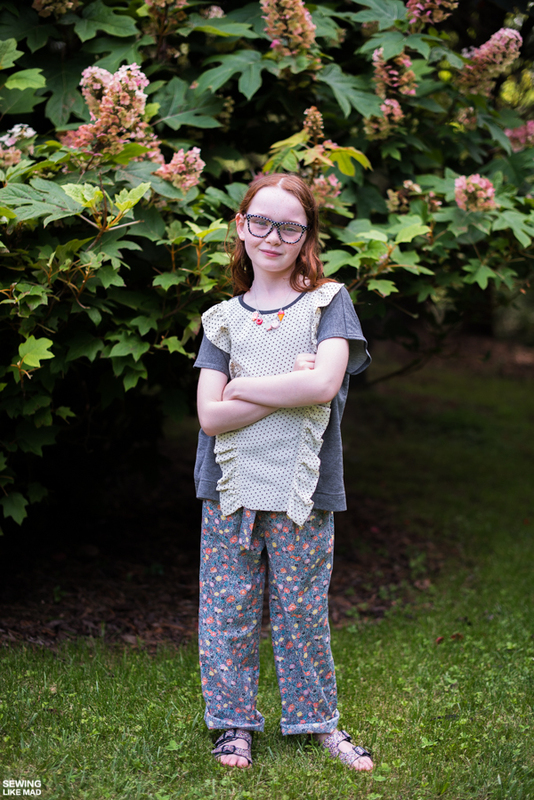 Sewing Like Mad: KANA'S STANDARD for kids - Ruffle Top and Pants. I said on Instagram that I wasn't going to blog this, but together with a few encouragements, I also realized there was quite a lot of information I wanted to give about this book and outfit that was better suited for a blog post than an Instagram post. 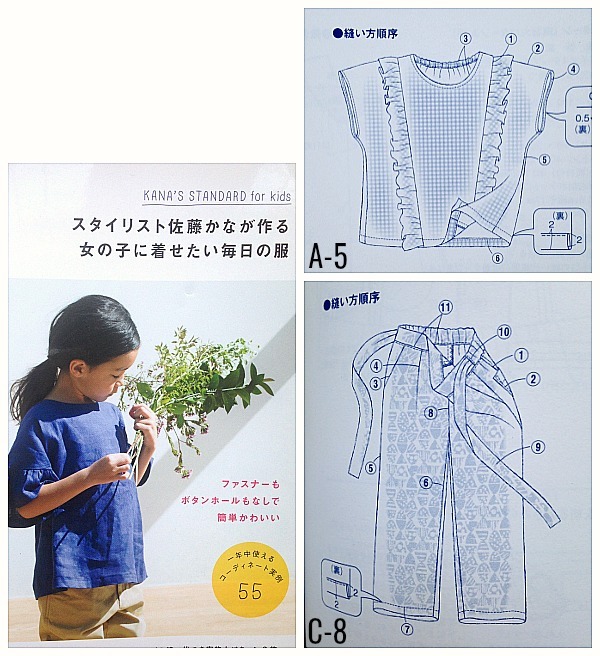 The patterns are from the Japanese Sewing book KANA'S STANDARD for kids. It's definitely not my first time sewing Japanese sewing patterns but it was my first time sewing Kana's patterns. And almost by coincidence, I found a HUGE surprise. The patterns in this book has seam allowance already added*. 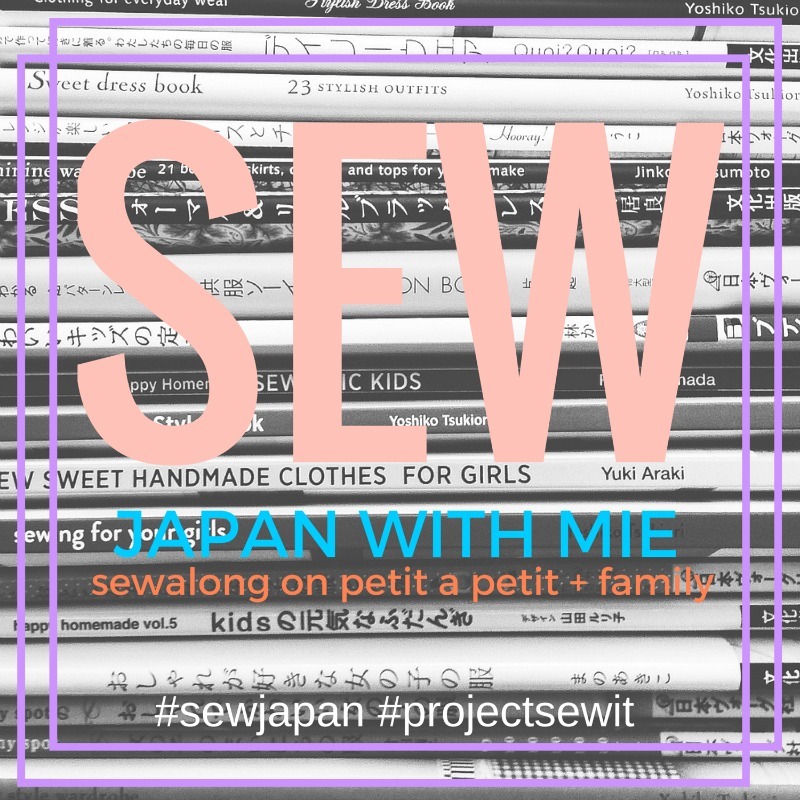 And for those of you not used to sewing Japanese sewing patterns, that is NOT the norm. Since they are written in Japanese, it's not like this Danish and English speaking lady would just be able to catch information like that by reading through the instructions. So I assumed it was procedure as usual and just started tracing my patterns (and planning on adding SA too). Luckily I started with the pants. Because when I came to the hem of the pant legs, the lines were very jerky and not straight. That made me stop and wonder because that certainly looked like what a pattern with seam allowance (SA from now on) would look like. You know if a pant leg is slightly tapered, then the SA needs to sort of widen again after the fold to fit the circumference at the stitch further up the leg. So I looked at the illustrations in the book and they looked normal and had the SA shown (which normally means, this is how much SA you need to add after tracing). So that didn't help and made me doubt myself. I also did notice some dotted grey (less visible) lines that could indicate SA but again, I wasn't sure since many patterns are printed on top of each other and it could be lines from another patterns. So I busted out the Google Translate app. Download it ASAP if you are sewing Japanese patterns and don't already know this app. Genius! You literally take a photo of the Japanese text and then mark what you want translated and to what language and in a split second you got your translation. Of course as with any automated translations, the result is not perfect but you can certainly normally get a gist of the text. And after a few tries, flickering through the book, I found it: SA is already added to the patterns. 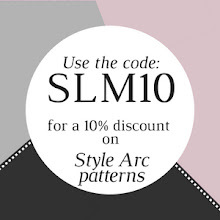 So hopefully my little discovery here can save you some time or potential sizing problems. Here is the book cover plus the two patterns I made. 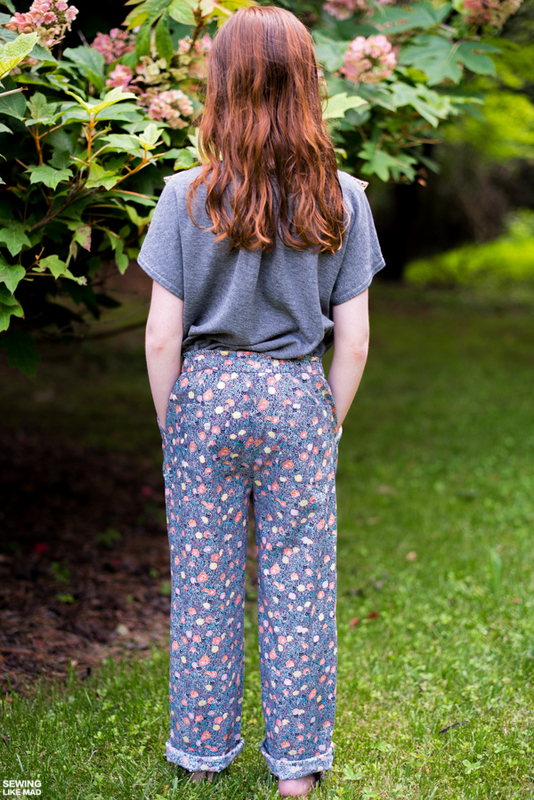 A-5 is a ruffle top for woven fabrics and C-*8 is a pair of back elastic waist pants with side pockets, back pockets, front pleats and front tie bands. Here are some hanger photos of the top. As I've said many times before, my daughters are not big woven fabric fans. Especially not tops for some reason. Well, they love the look of it but they don't end up wearing it. So I decided to use this very lovely soft double knit and then use a woven thin viscose for the ruffle and the center front piece. The center front piece is two layers (but sewn as one) because the viscose is see-through, so I added a layer of a very lightweight cotton voile. 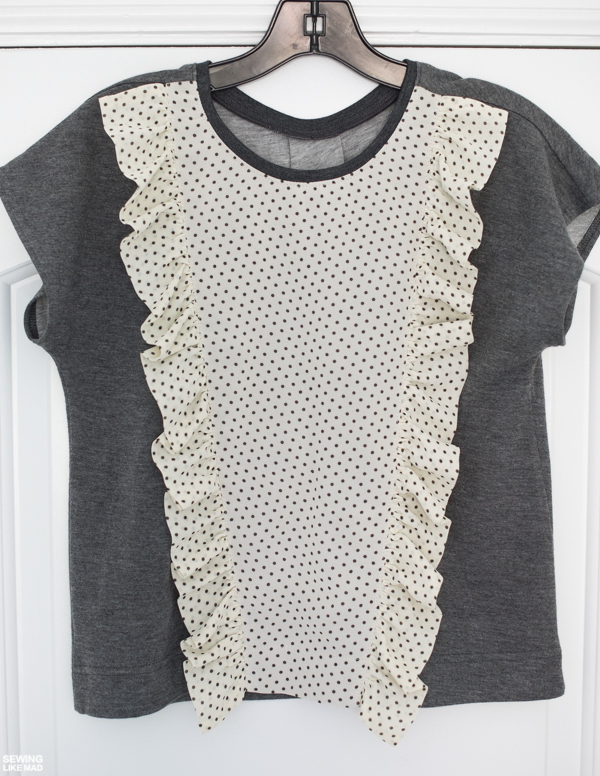 The ruffles are folded and finished at the top and bottom before gathered. As you might have noticed on the pattern illustration, the neckline is supposed to be finished with a bias tape and then the back part has an elastic (or rubber tie as the Google app translated it to, hahaha) pulled through. 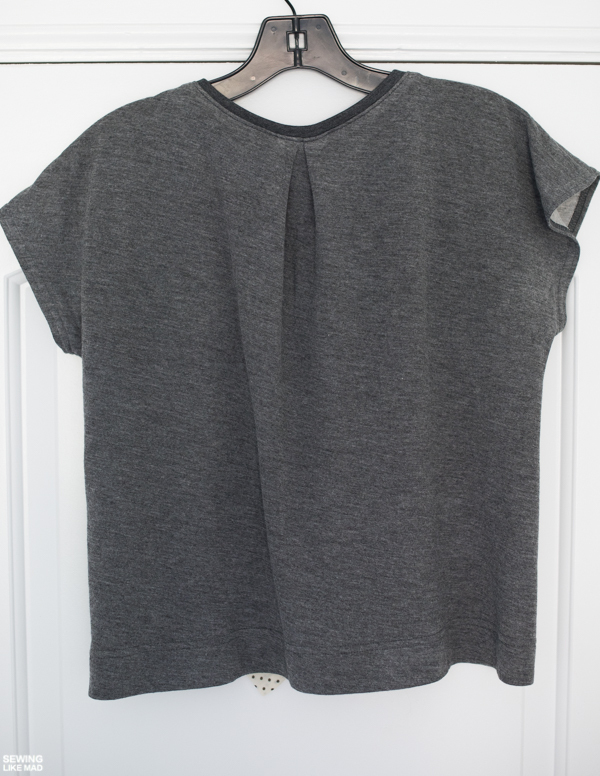 Since I made most of the top with a knit, I used a ribbing for the neckline instead. And I made a center back pleat (before sewing on the ribbing) instead of the gathering that the elastic would have made. Worked like a charm. I made her the size 130 and I think this seems like the right size. Big but not too big. She gasped when she saw it, so I take that as a good sign, ha. Photographing this fabric was soooo hard and I apologize for these not very clear photos. I took these hanger photos because I wanted you to see all the details that these pants have but I'm not sure they help much, ha. 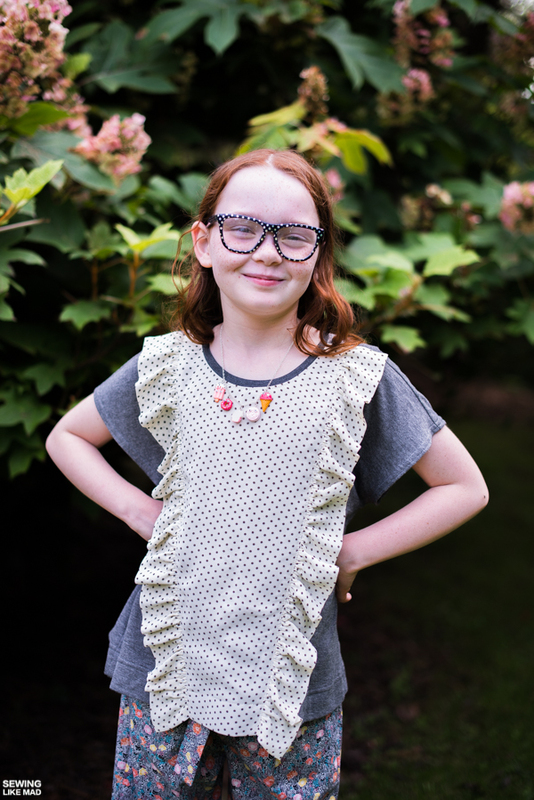 But it's a GREAT pattern and a really fun sew. The fabric is London Calling cotton lawn from Robert Kaufman bought at Imagine Gnats Shop. 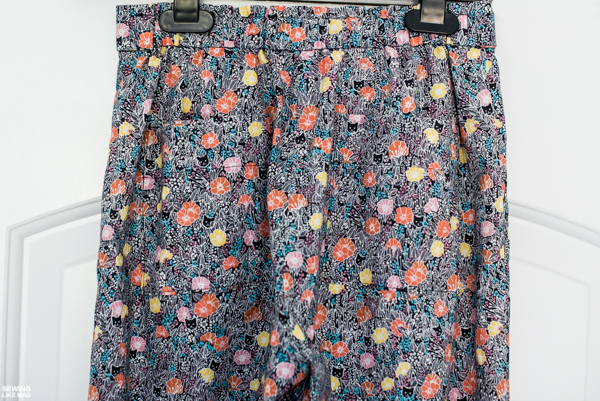 And I might get hate mail now but I almost think it's as lovely a quality as Liberty lawn - but to a much lower price. It has that crispy yet soft hand. It's thin but not flimsy. And it's not opaque. I really really love it. It's not very wide though so plan accordingly when you order. Also don't be scared when it says ultra lightweight (I was at first) it has a similar weight to Liberty lawn....which by the way is also called ultra lightweight. Sooo I guess that's just what they call it although I think the 'ultra' is a it much, ha. It is not hard to work with at all! Here is a close up of the front. 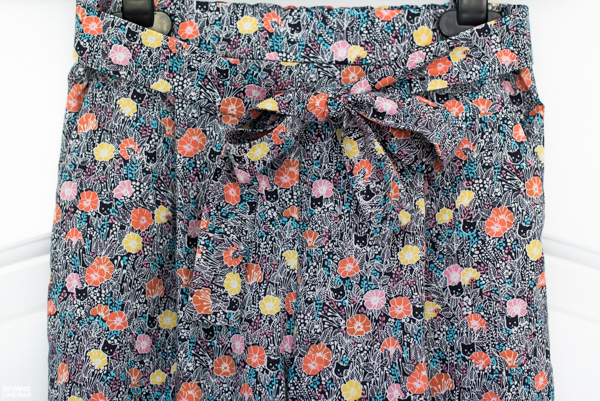 Maybe you can see the side pockets and the pleats. 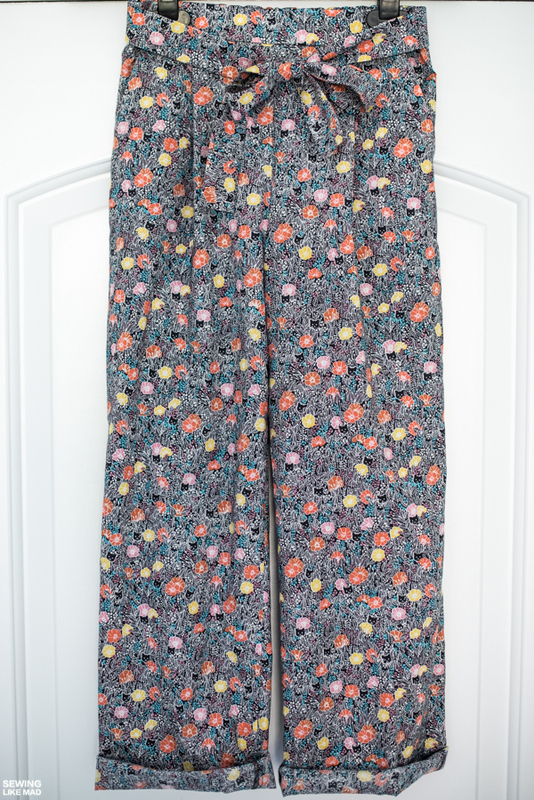 I interfaced the front waistband but not the back because it's later being gathered by the elastic and interfacing would just add unnecessary bulk. And the back....squint your eyes and maybe you can see the back pockets. (This is like one of those vision tests, ha). I didn't have the right width of elastic for the back waistband, so I made a stitch to make the casing fit the width I had on hand and then the above becomes a little ruffle. See a close up HERE on my Instagram account. It's both a neat little detail but also a great solution in cases of elastic emergency, hehe. And they fit her soooooo well. This is size 140 which is the biggest size in the book and I made absolutely no changes at all. That might actually be slightly concerning because my daughter is not quite 140 cm tall yet. I think they would be long enough for a child that is 140 cm tall (you can see they are too long for my daughter, which I was planning on) but I wonder about the width? Definitely something to check if you are sewing for an older child. While writing this post I actually learned that the book also have finished garment measurements stated. It's on page 57...where the information about the SA added to the patterns is also situated. She really really really loves this outfit and I really love it on her. 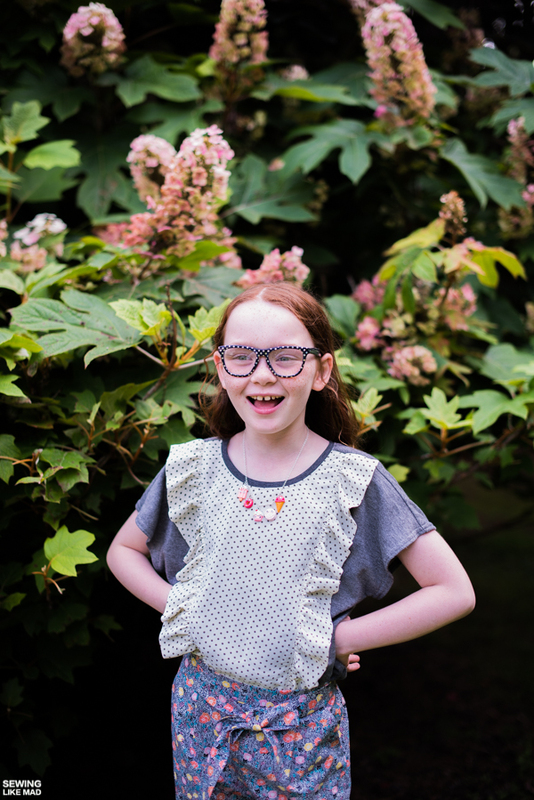 The necklace and glasses were her own additions. Told you there were side pockets. Thank you Celina for generously sending me this book. I can't wait to make more from it. 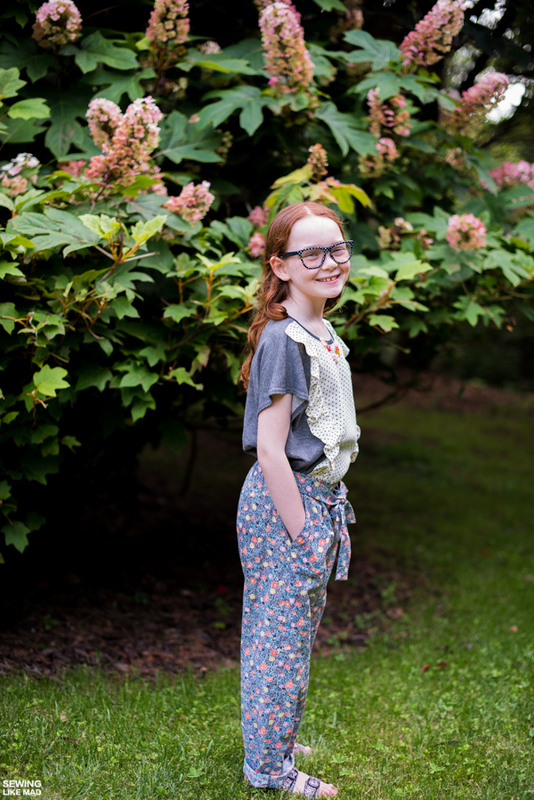 Both top and pants are lovely - I love how you managed to satisfy your knit-loving daughter yet add a bit of woven :) I've considered buying this book purely because it has SAs! I don't know if you know Jing from her instagram feed and blog, but she sews from both the Kana's Standard books and raves about them. Hi ��, it's Jing checking in here. I have to come check your blog posts after several brags on Instagram. The whole outfit looks beautiful, and most importantly, comfortable. ����Love love love it that the SA is included and I have the same problem with pants. Very narrow around the hips. My daughter has to wriggle them up, but once they pass the hip area, they are good. Now I know to go for a bigger size just for the hips. Glad you blogged this! The pants fit so well and I like the changes to the top. She looks so stylish! And wow, what a good catch on the SA! I would never in a million years have figured that out - well at least not until after I finished sewing the entire garment! High five! This outfit!!! All the heart eyes -- and thank you for blogging it! Now I can refer to your notes when I get around to convincing my daughters they need this super cute and cool outfit!